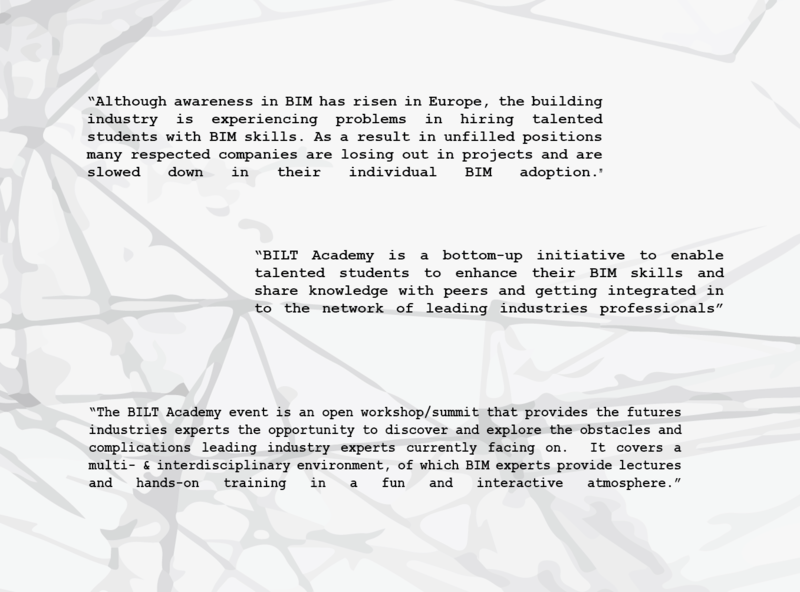 ___ We are BILT Academy a non-profit organization and part of the RTC Foundation in Europe. We are a group of hardworking students from different parts of Europe and focusing our studies and working hours in the fields of the building industry. We are not only going to be new Committee members of the BILT Conference but we´ll also act as a voice to represent the students´ commitments in the building industry. ___ Our goal is it to create a one-day summit including Labs with exciting and interesting experts as speakers. We are aiming for a multi- & interdisciplinary environment in terms of Architecture, Civil- and Structure Engineering, Computational Design and Coding. To emerging building industry experts, students will get the opportunity to discover and explore the BIM methodologies, the latest technological developments in software and project management. ___ We see it as an important step forward to provide students & educators the opportunity to discover the current state of the art practices and workflows in a multiple platform environment. Preventive, we want to fill the lack of communication and encourage collaboration. In order to challenge future problems and to provide students with knowledge in efficient workflows, we are aiming to develop a concept to inspire the next generation in the industry. Shaping the future Experts of the Building Industry. Creating a Sustainable multi-interdisciplinary platform to exchange knowledge. International Summit for Students in the Building Industry.